As AV and IT soldiers on into this brave new world of services and outcomes, PSNI is actively doing the same for its affiliates, as evidenced by the programming at its Supersummit in Dallas, TX, February 20-22. The Professional Systems Network International is a progressive industry organization bringing together carefully vetted systems integrators with preferred vendor partners (PVPs) to share expertise and best practices. The annual conference for its affiliates has been steadily growing in size, yet this year was most notable for its maturation in its mission supporting the industry. While affiliates reported that they commit the time out of their busy schedules to attend for the exclusive networking and a chance to address their challenges and opportunities with peers, this year’s conference programming really hit it out of the park, addressing some of the biggest issues the industry faces. Most impressively, there was a nearly two-hour segment devoted to cybersecurity. Another session focused on an area too often overlooked was an in-depth panel discussion on marketing opportunities for integrators, featuring various media representatives (including this one). Additionally, addressing the pressing issue of shifting business models, JB Wood, CEO of the Technology Services Industry Association delivered a pointed analysis of the new realities faced in a service oriented economy. The cybersecurity keynote was delivered by former White House CIO Theresa Payton, current CEO of the consulting firm Fortalice. She swiftly identified how vulnerable even the most savvy of security professionals can become, describing how she once used a small wireless auditing gadget to penetrate various devices at a conference for security experts. Left to right: Clint Hoffman, Kramer USA, Scott Allard, AVNOC, Bill Black, Synnex, Theresa Payton, CEO, Fortalice, and Tim Albright, AVNation. 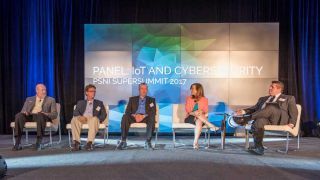 Payton advised Supersummit attendees that rather than focusing efforts on addressing hacks when they occur, integrators should strategize on the premise of when, not if, an attack will occur. She recommended four concise actions: admitting all security is defeatable, identify adversarial targeting, plan an aggressive offensive, and plan ahead. Asking questions like, “Who would want to make my life miserable," and directing your security team to act as an adversary are important considerations. All of these points are just as relevant for integrators to implement as they are for their clients. During the Q&A session of Payton’s keynote, some of the main takeaways were the advantages of segmented networks, the safety that traveling with a personal Wi-Fi hotspot affords, and the concept of a “prenup” agreement with any cloud services vendor, so when a breach occurs, businesses have clearly identified their rights with the vendor. JB WoodFollowing her keynote, Payton joined a discussion panel, which also featured insights from Clint Hoffman, Kramer USA; Scott Allard, managing partner of cloud-based network operations center provider AVNOC; and Bill Black, information security consultant at Synnex. They addressed the need to be good stewards of all the data in their possession, the unfortunate risk that most AV devices today carry, and how the threat of ransomware is pervasive and highly underreported as a crime. Concerning the latter, local police are often ill equipped to handle violations, and local FBI departments should be notified.In his look at shifting business models, JB Wood stressed the need to redefine profitability. New offers like managed services and pay-per-consumption business models are the future for integrators. While SaaS profits remain out of reach for most today, managed services are growing at a 43 percent rate, “because it can take down the operating costs of the customer,” he explained. Revenue growth is going to come from helping clients add to their bottom lines. As a whole, we need to be talking more about outcomes, he stressed, which is admittedly tricky.